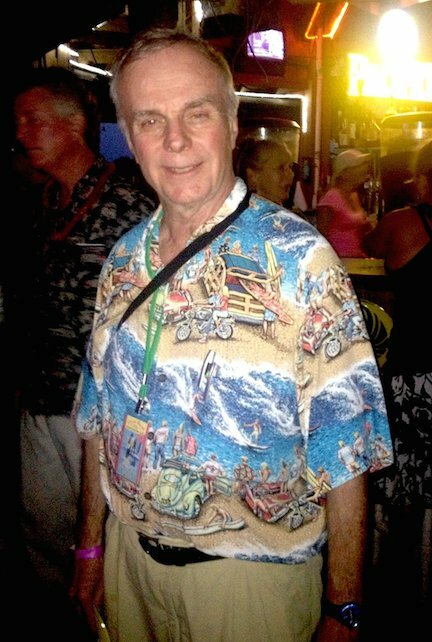 I was just getting ready to enjoy the traditional Independence Day repast of hamburgers, hot dogs and potato salad when I made the mistake of logging onto Facebook, where I learned that my friend and fellow pulp enthusiast Steve Kennedy has just passed away at the age of 70. Don’t know any of the details yet, but Steve never fully recovered from a stroke he had a couple years back, and he seemed to have trouble controlling his blood pressure, so I wouldn’t be surprised to learn that a second stroke laid him low. 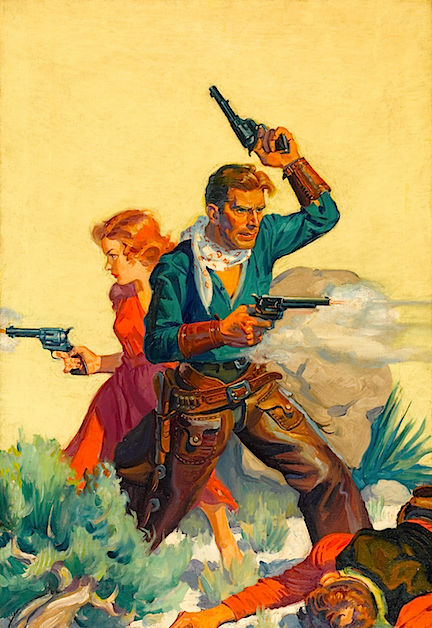 Steve was an art dealer by trade and developed a fascination with pulps after acquiring numerous cover paintings—mostly Westerns—by such artists as Walter Baumhofer, Robert Lillis, and Rafael de Soto. Although he resold the majority of them, he began seeking out other examples. Occasionally they wound up hanging on his walls, but more often than not reversals of fortune forced him to dispose of them to other collectors. I intend no slander when I say that Steve was one of the world’s worst businessmen; he could find a way to lose money on a Picasso even if he’d plucked it out of a garbage can with nobody looking. Unfortunately, some pulp-art collectors (including one well-known member of the clan whose name I’ll refrain from mentioning) rarely missed an opportunity to profit from his lack of business acumen. I first met Steve by bumping into him—literally—at a table in the Pulpcon dealer room 15 or 16 years ago. We were both looking through boxes of Western pulps and he explained that he was keen to find an issue of Pete Rice to which he had just obtained the Baumhofer-painted cover. At it happened, I’d just spotted that particular issue and directed him to it. We struck up a conversation that blossomed into friendship. I can’t say we were bosom buddies, but our paths crossed at least a half-dozen times per year. Steve Kennedy as he looked a few years ago. Though a New Yorker, Steve at pulp conventions hung out with a group of predominantly New Jersey-based collectors that included Walker Martin, Digges La Touche, Scott Hartshorn, Nick Certo (another New Yorker), and the late Harry Noble. When I met him I’d not yet become part of that group, although I joined it a few years later, shortly after launching Blood ‘n’ Thunder in 2002. Steve was one of the most laid-back, easy-going individuals I ever knew, although I later discovered that he was often consumed with anxiety owing to his financial woes, which were constant and often acute. He had a ready smile and was always eager to please, which made him good company. To be perfectly honest, I was frequently exasperated by his seeming inability to grasp simple concepts, and his absent-mindedness was legendary. (Once, upon flipping through a box marked “Dollar Pulps,” he actually asked the dealer: “How much are your dollar pulps?”) But there wasn’t a mean bone in Steve’s body and it was impossible to dislike or even stay angry with him. During his many years in the pulp hobby Steve Kennedy unearthed, bought, and/or sold some of the best surviving examples of cover art and interior illustration. Being primarily a collector of vintage magazines I never purchased paintings from him, although a couple years ago I put dibs on one of his recent acquisitions, a 1934 Dime Western cover by Baumhofer. He had no intention of letting it go but promised to sell it to me if or when he needed money. Unfortunately, he needed money when I had none to spare, so he sold it to Walker, in whose family room it now hangs. In his characteristically absent-minded way, Steve asked the painting’s new owner to refrain from telling me about the sale—forgetting that hardly a month passes between my visits to the Martin home. You’ll be missed, Steve. And when Walker, Digges, Nick, and I are making the drive to Columbus next month for PulpFest, you can bet we’ll be reminiscing about the times you drove along with us. The 1934 DIME WESTERN cover painting Steve promised to hold for me. I did not know the gentleman but enjoyed reading your tribute to him. Seems like a nice guy. It is difficult when friends leave us. A very nice tribute. Well done Ed and I am sorry for your loss. Damn. This is sad news. Steve was one of the good guys and I am going to miss him. I knew Steve and we got along well. I’m sorry to hear he’s gone and I will miss him. A nice tribute for a nice guy. Thanks for writing this up. I can see what a lot of the conversation will be about at Pulp fest this year.He will be missed by those that knew him well. Such sad news — thank you for letting us know. I also met Steve at PulpCon — he was always going out of his way to find things my grandfather had written (and even picked up a few things and surprised me with them). We used to hang out at the auctions, which he never left empty-handed. I was just chatting with him on Facebook a couple weeks ago. I can’t believe he’s gone. A very nice tribute to Steve. I have enjoyed many in-person and telephone chats with Steve. He was a kind, soft spoken, humble and intelligent person with a great insight in the world of pulps, pulp art, and in life in general. He was a genuinely a great person and he will be missed! Ed, Scott called me from Florida and told me the sad news. I’ve been friends with Steve for almost 30 years and he sold me many pulp cover paintings over the years. It’s been a few weeks since I heard from him and I was wondering why. I guess he was traveling out west. Another old friend gone. R.I.P. Steve. Steve was a generous, gracious gentleman. We so much enjoyed his and Jane’s evening with us some years back and talking about all things art, pulps and turn of the century comics. Thanks for your very nice tribute to a wonderful man. I was shocked to learn of Steve’s death. He was such a kind and thoughtful person – a gentleman in every sense of the word. My heart goes out to his devoted and lovely wife, Jane. RIP, Steve. I’ll miss seeing you around the neighborhood.